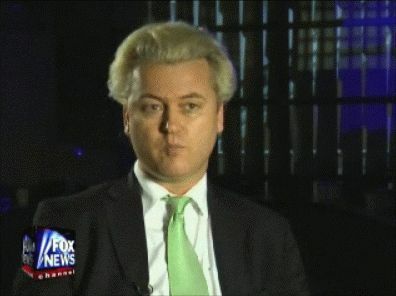 Geert Wilders Stands Up for Free Speech – “Fitna” Movie Trailer — 1389 Blog - Counterjihad! Fitna, The Movie Is Here – Where to See It? This is the trailer for the movie everyone is talking about. “Forbidden” by Dutch lawmaker, Geert Wilders. This guy has some b—s doing what he’s doing. Good for him though. Good to see someone stand with courage and speak out against the rise of Islam in Europe. I’ve also written about this here and here. Thank God for these brave anti-jihadists who are willing to put their lives on the line to get the message out. In which Greg Palkot encourages him to fear the reaper and Wilders politely declines. Here’s the man at the center of the gathering storm, addressing terrorism, multiculturalism, and even immigration in a 16-minute marathon. If you can only spare a few, watch the first two minutes and then skip to 12:00 or so for Palkot wondering if maybe it wouldn’t be smarter for him to quiet down a little bit. Wilders gives the right answer — an answer that’s not as easy anymore as it should be — but his own stance on how welcoming western society should be to dangerous viewpoints is more nuanced than he lets on. Brave guy. The Dutch left must hate him. Click the image [below]. Produce more movies more people will convert to islam. [ La ilaha illalah, muhammadur rasurullah ] Allah is Great and Mohammed is his messenger. MR. Wider, You are totally an….. Illiterate…… person.Before show something in front of world first read and LEARN what …..QUARAN …..says.You dont understand what u have done.U totally hurt the MUSLIMs and ISLAM………..I personally say to u that say sorry and apologize to the MUSLIM people for ur mistake.May ALLAH Forgive u.Thats what i pray..
first of all…this is what happen when we abuse freedom of speech. To much freedom make us blind and does not know how to respect others. Why must some individual be a catalyst of such a sensitive issues pertaining to Islam. Look at Palestine and Israel with their never ending occupation in that country. How on earth Israeli said that they are defending themself in other people teritory. In fact Media in Western always bias in their reporting and only shows the visuals of war. As for Wilders, he is actualy fear of Islam. Islam itself does not allow terrorism.But if some people wanted to ruined Islam, why must muslims keep silence?They must fought back but in wise manner. Killing is not the answer for any religion or any races on this world.Do not start to provoke or making ur own judgement before u understand the issues deeply. What Wilders deed hurting Muslim as a whole.But we are thankful to Allah because this is a hikmah for all of us to understand the sensitivity of other people. I hope we respect each other and do not ever allow the words or writing that can harm each other in this world.No matter what religion u are please dont start the hu ha..let us live in this world in peaceful and respect each other rights. Indeed understanding is very important. If a person does not care about feelings of other humans, then he truly is an ANIMAL!!!!! GET A lIFE pOLITITION!!!!! As the author of an investigative blog, I report a lot on censorship, conspiracies and oppression, and still this case has caught my attention. I am extremely happy to see a guy like Geert Wilders stand up for free speech, appose censorship and just plain do the right thing. Too often now people do what they feel is acceptable by their peers. Its when someone steps up regardless of popular opinion or government expectations that they are the unspoken heroes of our time. Next post: Hankering to go after some bad guys?